If you want a large 4K TV below US$ 1000, Samsung UN55JU6500 are Vizio M55-C2 simply the best for that price range. Coming with the 55-inch display screen, you would be very pleased with their performance. But, since you only need to buy one, you have to choose between them, right? I will try to help you choose between these two delicious cakes. Look : Samsung UN55JU6500 Vs UN55JU7100. Vizio has begun to step up. Last year, they were still making 1080p (full HD) TVs for their M series. Now, with the advance of technology, the trend has shifted to 4K resolution. 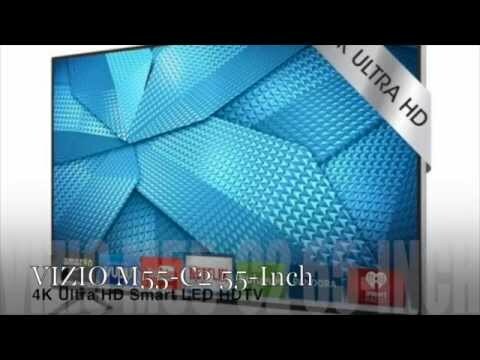 Vizio is trying to answer the challenge with the new Vizio M55-C2. As manufacturers often install their own features on their Smart TVs, Vizio is no different. In Vizio M55-C2, there is an advanced local dimming system to generate better shadows. Also, Vizio implemented 32 Active LED Zones in this product to provide stronger contrast and deeper blacks. As the result, images on the screen are bright, sharp, and intense. The Vizio product contains 120 Hz refresh rate, V6 six-core processor, and the Spatial Scaling Engine for 4K up-scaling. The resolution up-scaling is pretty amazing when combined with the TV’s strong contrast. Meanwhile, Samsung UN55JU6500 is the entry level of Samsung’s UHD TV lineup. The product is pretty rich in features, including the UHD Dimming, Contrast Enhancer, Wide Enhancer Color, and PurColor Technology. The resulting picture is satisfying. Glares are minimized; images appear natural and sharp. It also performs well in different black levels. Like other Samsung products, it is equipped with UHD up-scaling engine, too, supported by quad-core processor. Samsung UN55JU6500 has Motion Rate 120, delivering similar refresh rate with the Vizio product we previously talked about. If we compare their output quality, they are really in similar level, although Vizio M55-C2 gives slightly more pleasant pictures. The Vizio Smart TV also provides more power with its six-core processor compared to Samsung UN55JU6500’s quad core. However, Vizio M55-C2 only has 1 USB input, while Samsung UN55JU6500 has 3 USB inputs. Also, Samsung will likely support more apps than Vizio due to their different platforms (Samsung Smart TV Tizen-based OS vs Vizio Internet Apps Plus). So, if you want more power in performance, you should purchase Vizio M55-C2. Instead, if you value the possibility of versatile usage better, choose Samsung UN55JU6500.